Revision knee replacement surgery is not often necessary, as most arthroplasty surgeries are successful. However, as with any surgical procedure, complications can occur, resulting in a failed knee replacement. Treatment typically requires a surgery re-do, in which the implant is replaced. In some cases, patients require bone grafts or metal augments to strengthen the joint. With the MAKOplasty robotic-assisted procedure, revision knee replacement surgery is rarely required But an implant can fail for several reasons. Implants are securely attached to bone for stability. But over time, they can loosen. General wear and tear on the components is often the cause, and patients who regularly engage in high-impact activities (playing basketball or running, for example) are at greater risk of a failed joint replacement. Excessive body weight can also contribute to implant failure. Infection is a potential complication after any surgical procedure. Infection may set in immediately, or shortly after the procedure. In some cases, the artificial joint becomes infected years later. When infection causes an implant to loosen or creates significant pain, swelling and drainage at the joint, revision knee implant surgery may be necessary. A knee implant is designed to work with the patient’s ligaments. So if ligaments develop damage or become unbalanced — due to a sports injury or fall, for example — the implant may not function properly. When bracing, physical therapy or other conservative treatments can’t correct joint instability, revision surgery is usually required. Occasionally, knee replacement surgery can result in excessive scar tissue growth in the joint and surrounding soft tissues, although this is rarer with the MAKOplasty™ robotic-assisted approach. Too much scar tissue can lead to stiffness and limited joint mobility, conditions which may call for revision knee implant surgery. If one of the bones around a knee implant fractures from a car crash, a fall or other accidental impact, revision surgery may be necessary. With a broken bone, failure typically occurs because the implant no longer has the proper support and stability. At the time of the original surgery, the implant must be properly positioned and aligned. If it isn’t placed with precision, the result may be a failed joint replacement. Failure is much less likely with MAKOplasty™ robotic-assisted surgery, however, as the technology allows for better accuracy than conventional surgical procedures. Are you considering knee arthroplasty, or do you need a revision knee replacement? Schedule a consultation with Dr. Trevor H. Magee at Steward Centers of Orthopedics & Sports Medicine. 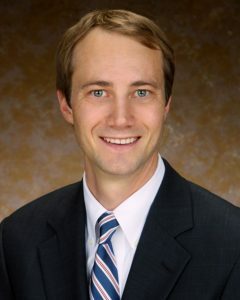 Dr. Magee is one of northern Utah’s leading knee reconstruction specialists and a fellowship-trained orthopedic surgeon with expertise in MAKOplasty™ robotic-assisted implant procedures. Contact our Salt Lake City, Sandy or Park City office today to schedule a consultation to discuss revision knee replacement surgery. This entry was posted in Joint Replacement, Knee on October 23, 2017 by Trevor Magee, MD.